It's funny, I was just re-reading my blog from more than a year ago describing my experience auditioning for Music Man... And how stressful auditions can be. Today I again put myself through that stress in hopes of getting into another show. It's all for the crazy, out of control, passionate love I have for musical theatre. Above is me in my audition outfit. Yesterday was Day 3 of my deactivation from FB. I have to be honest. I expected my withdrawal symptoms (feeling "lost," wanting to check it every half hour, feeling like I won't have friends anymore) to get steadily worse as the days went on. But yesterday was an amazing day. I felt freedom. All this was gifted to me because of several very dear people in my life that showed up in a big way. I don't think they even knew I needed it. They were just being themselves and loving me, and being good friends (and husband). Being with them made me realize that even though I am not currently participating on the most social online site today, I was not going to lose my heart-saving friendships. Instead of feeling lonely, I felt filled up. Instead of feeling the need to check on everyone's lives, I felt free. 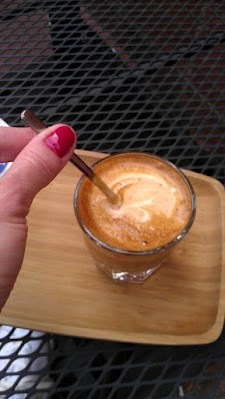 My delicious cortado at Aviano's yesterday. Good coffee helps too. During the conversations with my friends yesterday, I realized something in my heart has shifted. My heart has expanded with the loss of FB to reveal an empty space that is being filled with some amazing face to face, phone, and email conversations with people that I love. I was able to love them and be loved in a deeper way somehow. My beautiful friend Rachel and I. We met during our run of PNTC'S "Oklahoma!" and have remained good friends for two years. I saw "The Hunger Games" again last night with Casey. I am deeply struck and humbled by the self sacrifice by the two main characters, Katniss and Peeta. They are willing to lay down their very lives for the other and for their friends and family. As I experienced this beautiful story again last night, I realized, "I have friends like this." Maybe we don't have to literally lay down our lives for another. But-- I have amazing friends who have held me up and laid their hearts down to help me in sorrow, joy, and the mundane. And, in the last few days, they have proved that they will continue to. I am blessed. What's wrong with your cups?!? Confessions of a Deactivated Facebooker. I never thought it would be me. But then again, one never does. I am a self proclaimed Facebook lover and have often sung its praises to anyone who would listen. And yet, two days ago, I deactivated my FB (Facebook) account. Many people have asked why I've done this, most with incredulity, knowing how much I love FB. In a nutshell, I did it because it had crossed the line from being a healthy, fun social activity to a full blown distraction in my life. Please hear me: I fully believe FB is a wonderful social media site that has many useful possibilities in relationships and businesses. 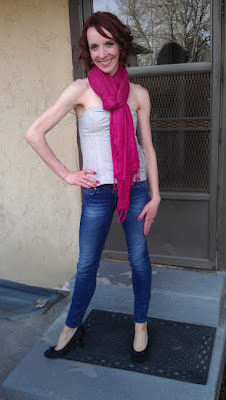 I still am managing my social media marketing page (SugarPlum Ltd.), my grief outreach page ("that which was lost") and the Ballet Ariel page. I have, however, made the decision to temporarily step back totally from my personal page. In case you are wondering what the difference is between "deletion" and "deactivation," deletion means exactly that-- you can no longer retrieve your profile, pictures, info, and anything you've posted. Deactivation means you are switching it off with the option of coming back later to your profile, without deleting any data. As I shared in a previous post (http://eslingers.blogspot.com/2012/03/sounds-of-silence-day-one-of.html), I have been deeply struck with the amount of silence I hear in my head. It is no longer ringing with the sound of other people's voices. And, being a half-extrovert, it has been a bit disconcerting. I love hearing about other people, being in the know, and conversing with friends about their lives online using the written word. Last night I had a dream that I had a hole in my forehead measuring about three inches in diameter, which showed a small space completely EMPTY inside my skull. I'm pretty sure my subconscious was pointing out my FB withdrawal symptoms. There is a figurative hole where all that used to be. Addictions are powerful little things. The instant gratification of hearing back from people, the comments and interaction that I have been so used to on FB, is suddenly gone. And honestly, there is a bit of loneliness that comes along with that. The freedom I've been feeling from being tied to a website, however, is fighting the addicted side that wants to immediately get plugged back in. Another positive of the situation is that I am enjoying my face to face time with people in a much deeper way. So, I plan to keep blogging about this deactivation journey as I walk on. I wonder how many people out there have had this same, similar, or a completely different FB experience? Tell me about it! Your Breath Smells Like Chocolate. Ok, so this clearly is not me (I am much more tan... hahaha...) but I wanted to post this picture and share my little moment of excitement-- I GOT A NEW LEOTARD! These tend to be pricey, so I got this for my upcoming birthday (April 28th). It is the same style as this one, but mine is a dark gray with a yellow collar and red buttons. It's the first I've gotten from Eleve Dancewear, and seems to be a really great quality as far as leotards go. I got to wear it for the first time in ballet class this morning. Many dancers will agree with me that wearing a brand new leotard brings a spring to your step (point?). We do so many of the same steps over and over, day after day, and having something pretty and new to wear brings novelty and excitement to class and rehearsals. You just feel prettier, and in my case, I tend to dance better when I feel pretty. What brings excitement and novelty to your workday? I'd actually love to hear some comments on this! Feel free to subscribe and comment on this and on my other blogs, I love conversations (which is what I'm missing most about Facebook right now). And let me know if you have your own blog, I'd love to follow you. It's been about 11 hours since I deactivated my Facebook account. What I hear is... nothing. The sound of silence fills my head to the brim-- my head which is usually filled with the many voices of people posting about their days, activities, opinions. I have to tell you, it is strange. I have had many moments already where I think "I should post that," especially in the last half hour as I watched a few funny videos. I have had many more moments when I realize I've gotten used to the constant dull roar of the happenings in everyone else's world. Not that this is necessarily a bad thing-- but what I'm noticing is I'm hearing more of my OWN thoughts instead. And for some reason this is also strange. How have I gotten so used to the sound of so many other people in my head? Another Cinderella slideshow... Denver Post photographer captures us in rehearsal. One of the beautiful black and white photos the Denver Post took in rehearsal... Me in my Stepsister costume spinning! Slideshow from Ballet Ariel's "Cinderella"! Check out some shots from rehearsal and performance. I played one of the Stepsisters and also the Summer Fairy in this very beautiful and entertaining production! This morning I de-activated my Facebook account. Yes I agree, it is very ironic that I am BLOGGING about taking a break from this social media site... And so it goes. I love to communicate with words. For me, blogging more is going to be a great way to expand on my thoughts and experiences, compared to the 2-3 sentence status update... I am even thinking of keeping a journal of "status updates" that only I can see. It feels strange even now (an hour into my Facebook deactivation) to not share about my new haircut and color (red! ), what I am doing, how my beautiful friend called me this morning and how much I loved that, etc etc with all of my friends and the world. But I really think this is going to be a great thing for my soul. Exorbitant amounts of time online can kill a soul, I've found. I don't intend for this to be permanent, of course. I do love Facebook. But I don't exactly know how long I need away. I guess I'll have to settle for not knowing. Four years ago, and not by my own choosing, I began contemplating grief in a serious way. It is a funny thing, grief. It appears to be a road that no one by choice turns onto, where one's heart is force to walk upon stickers and other painful things, for much longer than anticipated... Just when you think the road is coming to an end, you find it is just a curve. There are no detours or shortcuts. In my experience, the longer or more times you walk this road, the stronger your heart becomes-- and it isn't such a shock when you find yourself on this path again. But... The best thing about grief is the people. Those who walk beside you willingly on your journey are the ones to be truly treasured, and the ones you often get to keep forever. May God help me be one of these people who will walk beside you in your grief journey.